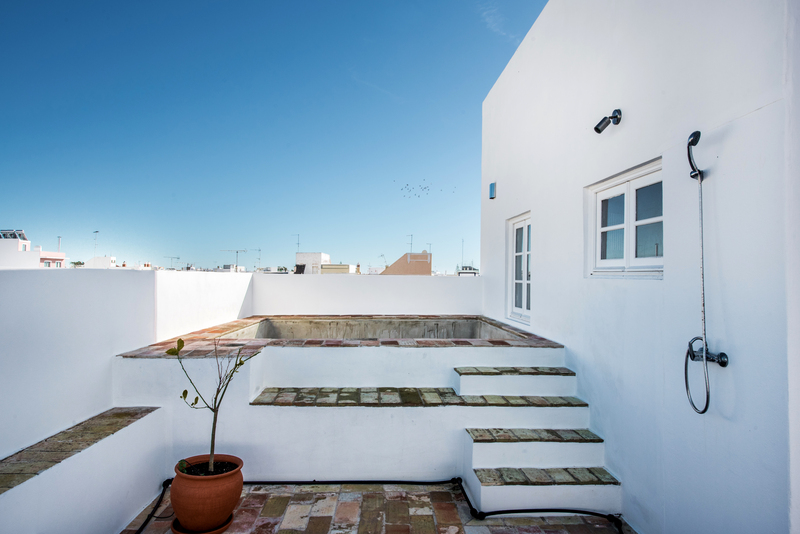 An exceptional renovated townhouse in the heart of Olhao. Sleeps 6. Furnished to a very high standard with interesting little features around every corner. Beautiful original tiled floors. The house surrounds a private internal court yard. The rooftop offers a private swimming pool with amazing sea views. 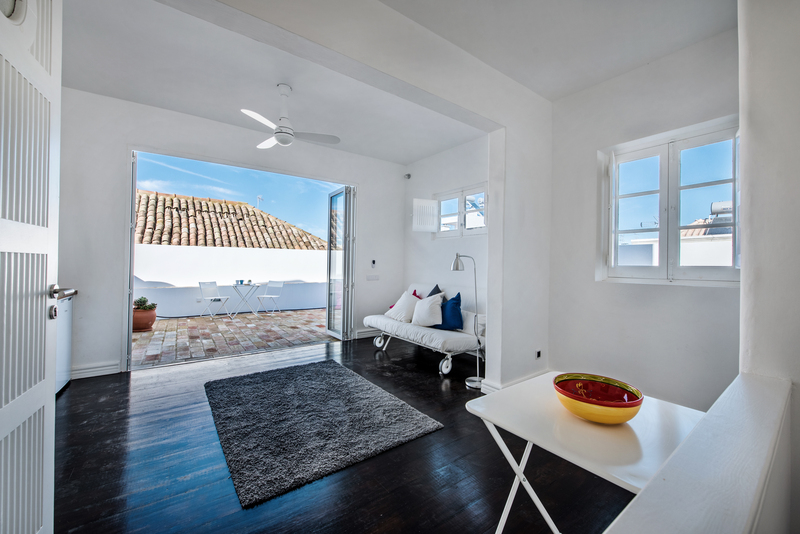 Casa dos Amigos totally encapsulates old and historic Olhao but with all the creature comforts you need for an awesome holiday. This is one amazing house with such a great deal of thought and love having been put into bringing it back to life for our generation to enjoy all over again. 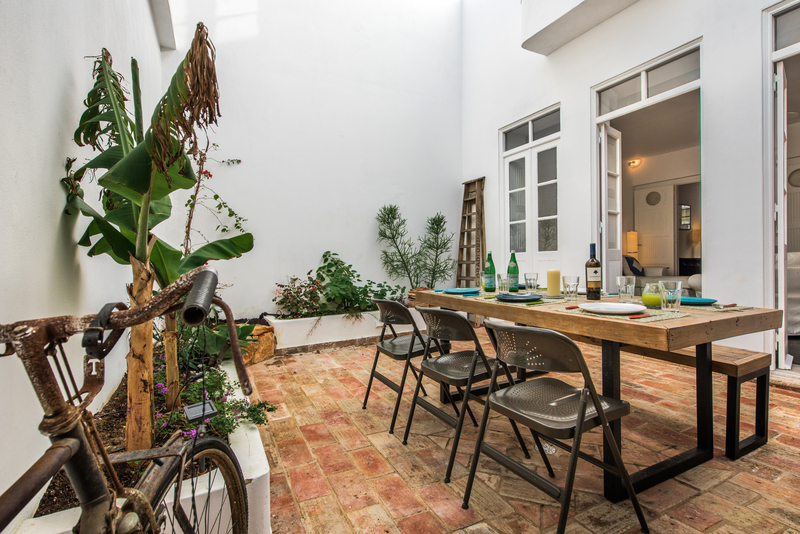 Casa do Amigos, our gorgeous renovated merchants house is located right in the heart of Olhao on a very quiet little street. This 3 bedroom townhouse sleep 6 very comfortably. 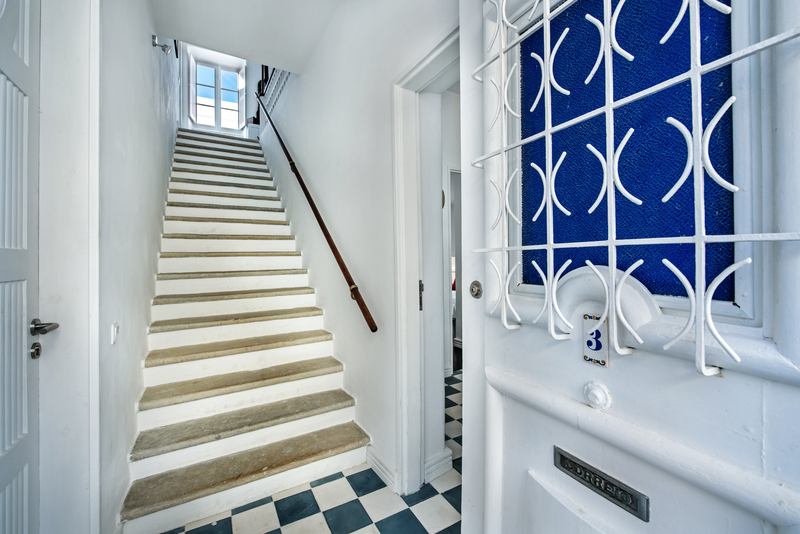 From the street and old fashioned wooden front door with an opening window and ornate iron work very much in keeping with the area opens into a vestibule with white washed walls, typical local tiled floor a lamp and art on the walls. 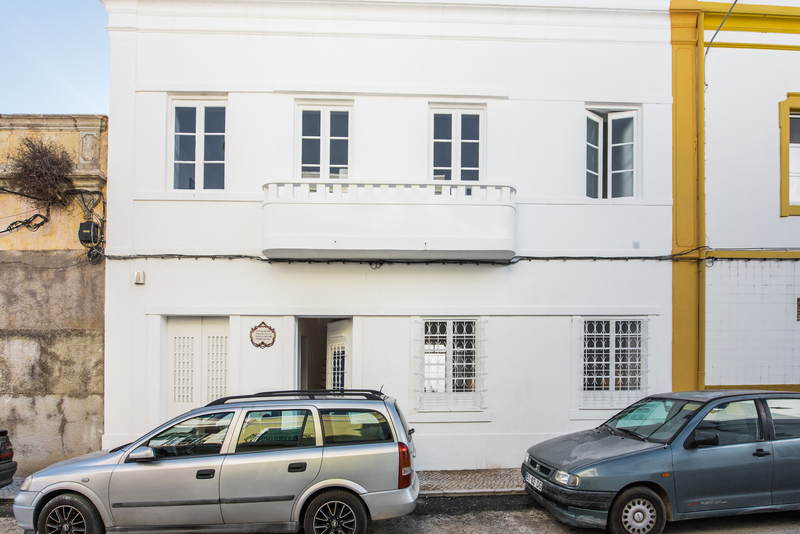 Directly in front of the door in an enclosed marble stair case leading to the first floor and to the right is a door leading to the music room and a door leading to the open plan ling space that surrounds the internal courtyard reminding you of the Moorish connections Portugal has. Even the doors are fun with little circular windows to capitalise on the natural light and remind us of the nautical connections in this area. Taking the first door on the right from the vestibule this leads to a room to the front of our 3 bedroom townhouse. 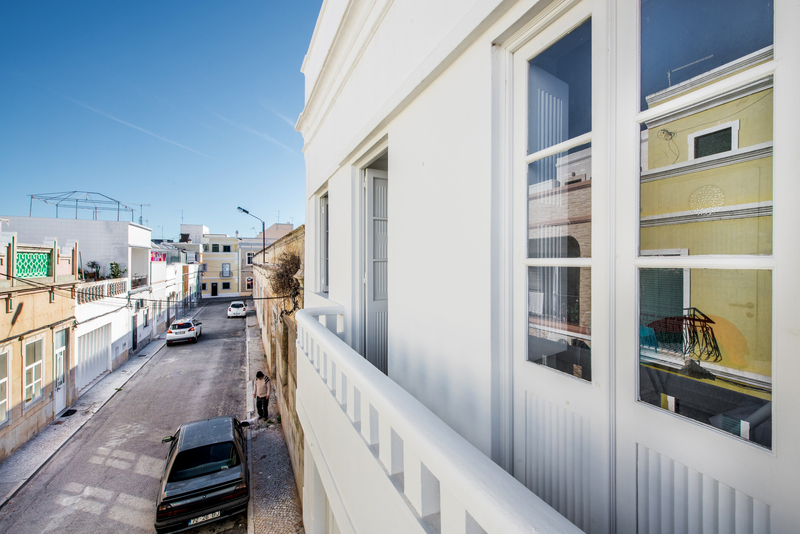 A window overlooks the quiet single lane street to the front of Casa dos Amigos and lets in plenty of light. Typical wooden shutters can be used to keep the room cool in the hot summer days. The windows can be left open as the pretty wrought iron work on the outside keeps the house nice and secure. 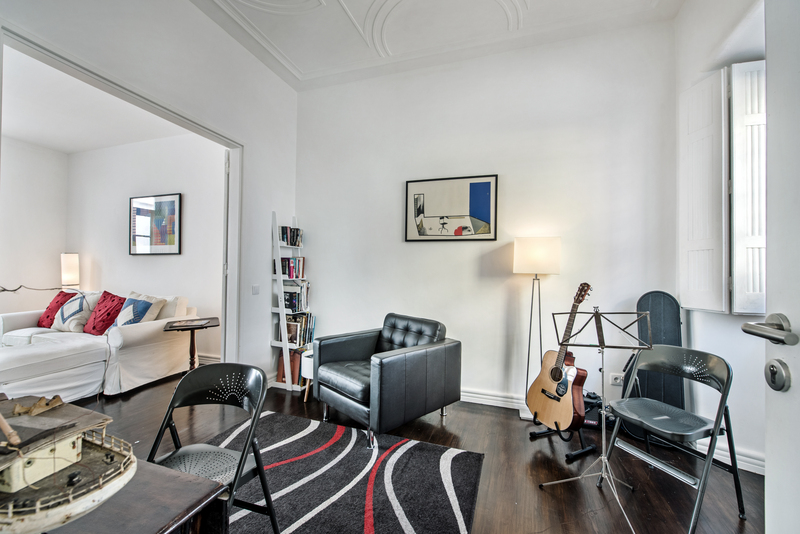 This room is designed by the owners as a music room and decorated in an artistic and elegant style with wonderful little thoughts and touches. Chairs have been placed to give you a quiet place to sit and enjoy some music or maybe read a book. 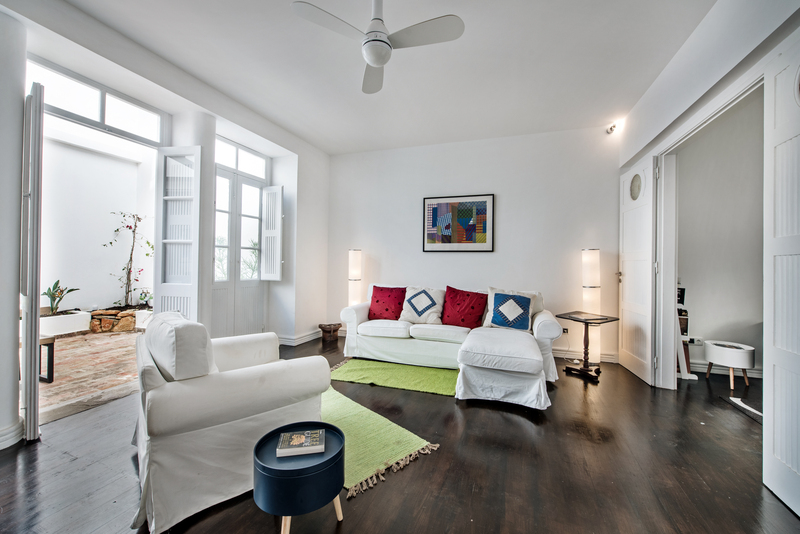 White washed walls keep the room light and wooden floors remind you of the antique features of the great 3 bedroom townhouse. Great big huge doors open into the living space meaning you can either use the music room as a quiet and private place or open the doors and incorporate this room in to the open plan living. From the vestibule the second door on the right leads to the very spacious open plan living area thats wraps around an extremely private internal courtyard. Whitewashed walls and dark wood floors add depth and contour tot eh ground floor of this 3 bedroom townhouse. From the living space beautiful ornate pillars stand between 3 double patio doors in the antique wood and half glass that open right up to the internal court yard allowing light to floor in to the room. The window panes are equipped with the original shutters that can be closed to keep the room cool from the hot summer sun. These doors and pillars create the most stunning room to enjoy and allow the wonderful warm weather the Algarve offers in to the room. This space is made exceptionally enjoyable by the flexibility that it offers. flanked by two free standing lamps along with a mix of coffee tables. Opposite the sofa sits a wonderful large white fabric arm chair. Both decorated with colourful scatter cushions to keep the space bright and fun. Here you have the large double doors that open in to the music room. When open they make the space feel even more open, light and spacious. A large flat screen television offers a mix of European channels to try and suit all tastes. The whole ground floor is one room and in an "L" shape. In the corner of the "L" is the kitchen and at the bottom of the "L" is the dining space. This area has modern windows thats slide to each end of the wall and totally open up the room in to the central court yard. In this area is a simply fabulous antique dinning table and four antique chairs, all slightly different adding to the wonderful mix and match of this simply beautiful 3 bedroom townhouse. Against the side wall is a huge mahogany dresser, very much in keeping with the age of the house. It is filled with a wonderful mix of modern and old ornaments and nic nacs. At the end is w wonderful old sideboard with a gracious antique candle holder along with an old dress makers dummy to add that the off beat and vibrant nature of this 3 bedroom townhouse. The wonderful windows again let in that all important natural light and make the room feel massive with the fact that the courtyard can become part of the open plan living space. The living space has the added comfort of ceiling fans to keep the room cooler in the summer months. Wifi is supplied throughout out the living space too. In keeping with the simple white theme, the kitchen is designed from white fitted kitchen units with old style handles on the cupboards and drawers. 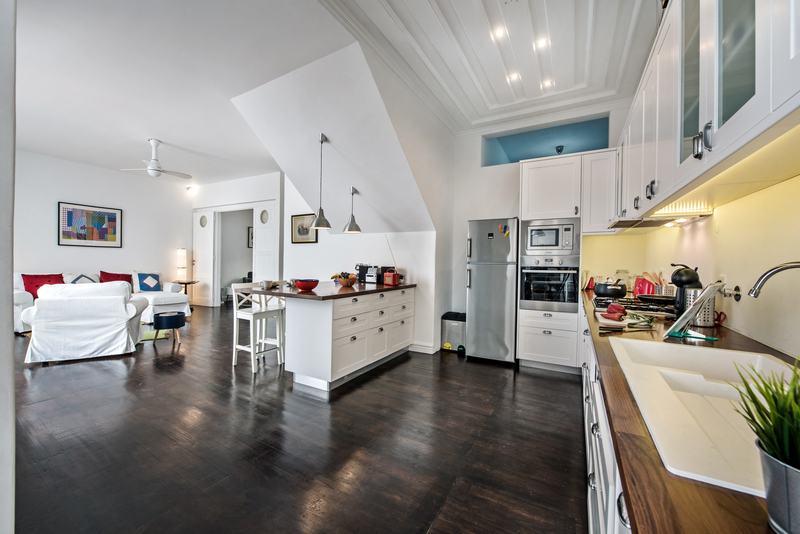 A breakfast bar and bank of cupboards divide the kitchen form the living room and stool have been provided to making entertaining easy and pleasant. The lucky guests can sit and enjoy a glass of wine whilst the other guests cook! Although this has to be one of the nicest kitchen to create amazing meals especially from all the gorgeous, fresh locally caught or grown produce Olhao has to offer. The wooden wok tops add a touch of colour to the kitchen and are in plentiful supply. On the work surface you will find the essential items to include a toaster, kettle and coffee machine. The kitchen is integrated and offers an eye level electric oven with a built in microwave above and to the left and full size fridge freezer. You will also find a four ring hob surrounded by pots of cooking utensils and above an extractor to keep out too many cooking smells. A white sink adds a new dimension to the kitchen and above the work surfaces are eye level cupboards some with windows that are crammed full of mugs, cups, glasses and crockery for your use. Below the surfaces cupboards contains plenty of cookings pots and serving dishes. The kitchen is amazingly well equipped for a large family home and you should be able to find everything you need to enjoy this self catering 3 bedroom townhouse. 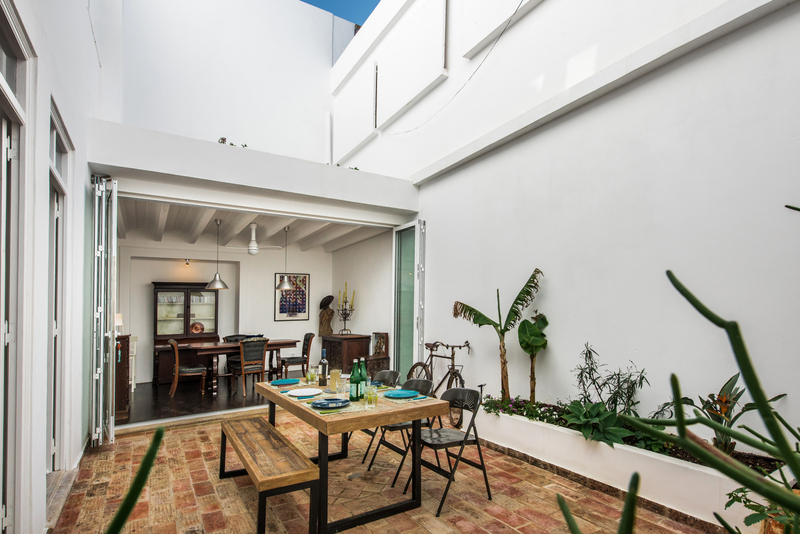 The light, spacious open plan feel of the ground floor at Casa dos Amigos is spectacular and an extremely enjoyable space. 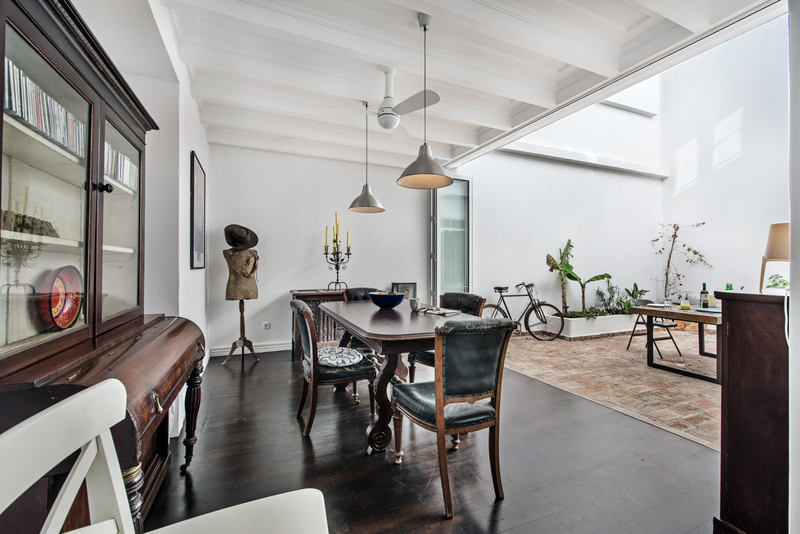 The character of the owners really pull through with their wonderful tastes and eye for details. 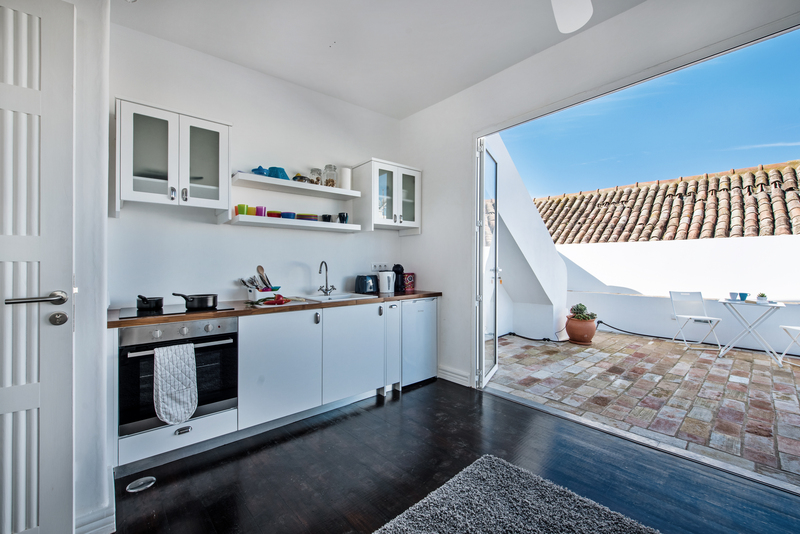 Jumping up to the second floor of Casa dos Amigos before heading on to the roof terraces you have the added joy of a small kitchen area made up fo fitted kitchen units with an oven and hob. A white sink with mixer taps. A kettle, toaster and coffee machine and some essential crockery and cutlery items. This space also makes a lovely living space with sliding double glazed windows in keeping with the theme f the rest of the 3 bedroom townhouse. This mezzanine style room has a futon to enjoy and shuttered windows look out to the terrace. This little area is a great and thoughtful addition to the house. Guests can take full advantage of the kitchen area with out having to go all the way back to the ground floor. Under certain circumstances the futon can be used as an extra bed. The space is also great for those who may not wish to sit outside but still enjoy the Company of the rest of the family and friends. The sliding doors open so wide it feels like you are on the terrace too. A ceiling fan also helps keep any guest wanting to sit away form the sun cooler too. 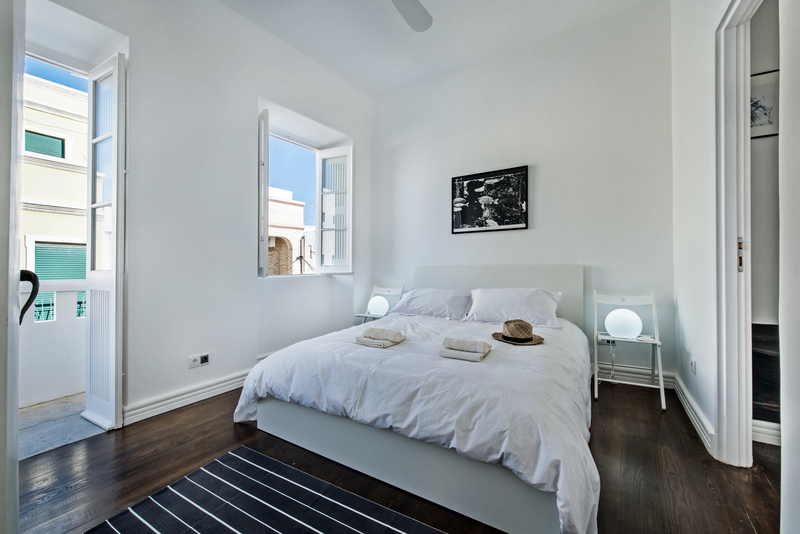 At the top of the marble staircase the first bedroom is the the right and offers a huge king size bed, white chairs act as tables and both have lamps to add an ambient light to the room. White wall and the dark wood floor give way to allows wonderful objects and paintings to add the colour and variety to the room. A windows looks down to the internal court yard and lets in heaps of natural light, but shutters can be closed to give a nice dark and cool bedroom. Also a ceiling fan is installed to keep the room a little cooler in the summer months. A wooden white door with that unusual round window give access to the en suite bathroom. This over looks the front of the 3 bedroom townhouse. The en suite has the most sublime antique style free standing bath with silver legs. 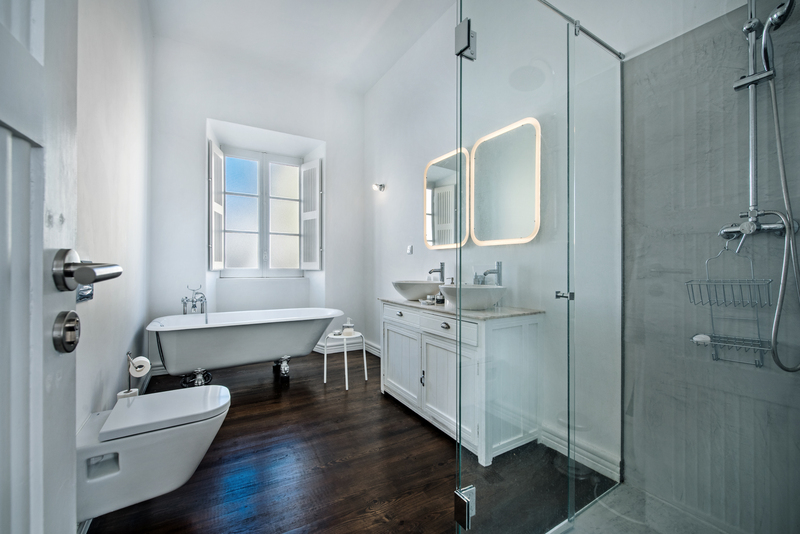 In between is a toilet and a basin set into a white antique style vanity unit. underneath is a cupboard with plenty of space for toiletries and cosmetics. Here we have placed a hair dryer for your use. Over the basin is a lovely large mirror. A shower are is enclosed by glass and styled in the ultra modern grey walling and offers a super large shower head. This is a super en suite bathroom and adds a touch of comfort and luxury to the master bedroom. The second bedroom is to the left and along a small passage way to the front of our 3 bedroom townhouse. 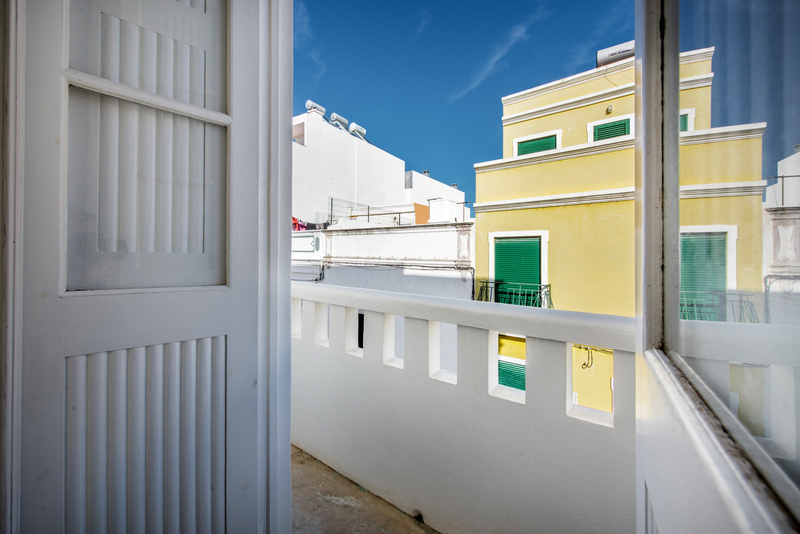 A large window with shutters look down on to the quiet street below and double doors open to a small balcony that adorns the front of Casa dos Amigos. 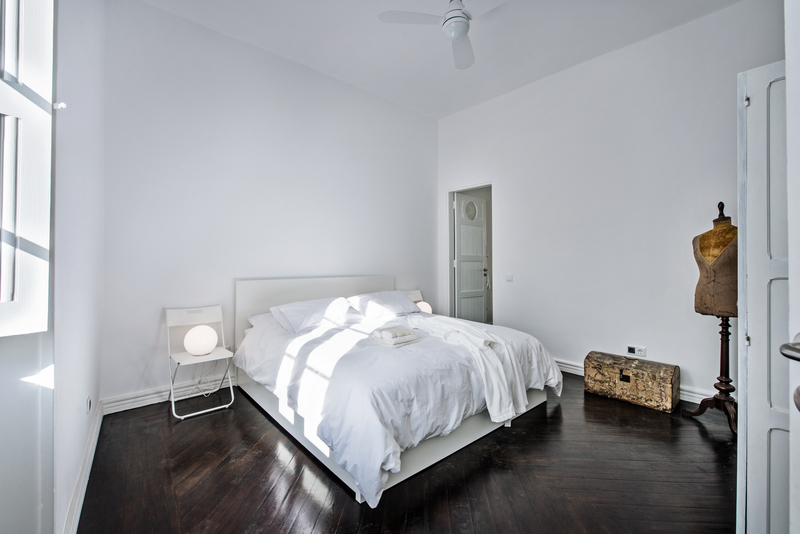 These two features make for a light and sensuous bedroom. A king size bed with a white head board is flanked by two chairs acting as bedside tables with lamps and a ceiling fan above for your comfort. Made with crips white, freshly laundered linen the bed is warm and inviting. 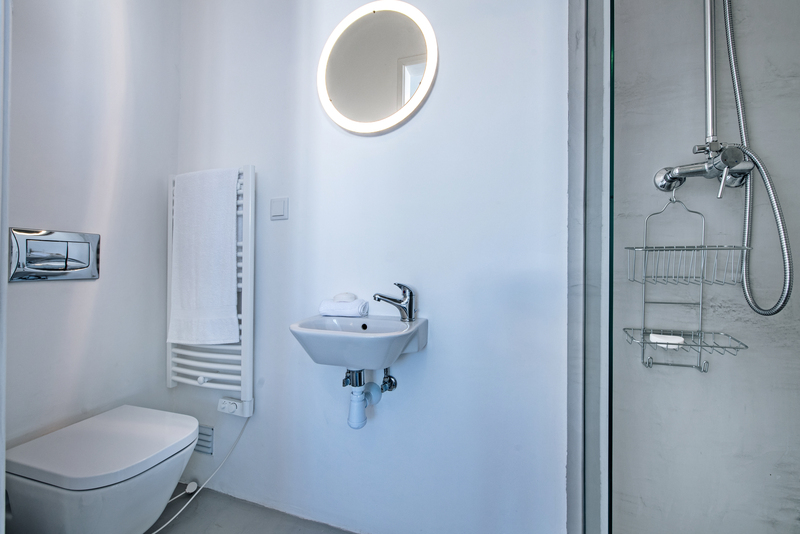 A door leads to the ensuite bathroom and offers a large shower enclosed by glass a toilet and small basin. The room is simple, modern and practical. The third bedroom is also to the front of the house with one window that looks out to the street below and offers bunk beds. A ceiling fan makes sure the room can stay nice and cool too. 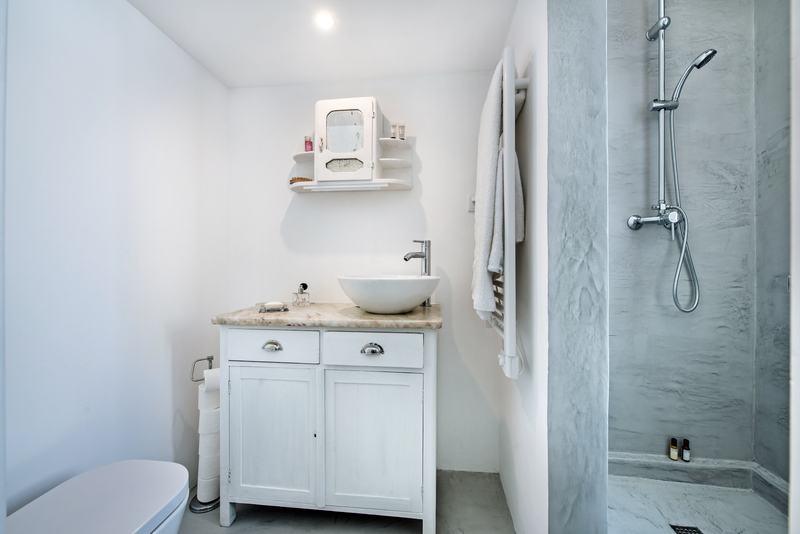 A third bathroom is also present on the second floor with a walk in shower, toilet and a little round basin set onto the top of the marble topped vanity unit. Above is a little antique medicine cupboard with shelves each side reminding us we are in a wonderful old merchants house for our holiday. 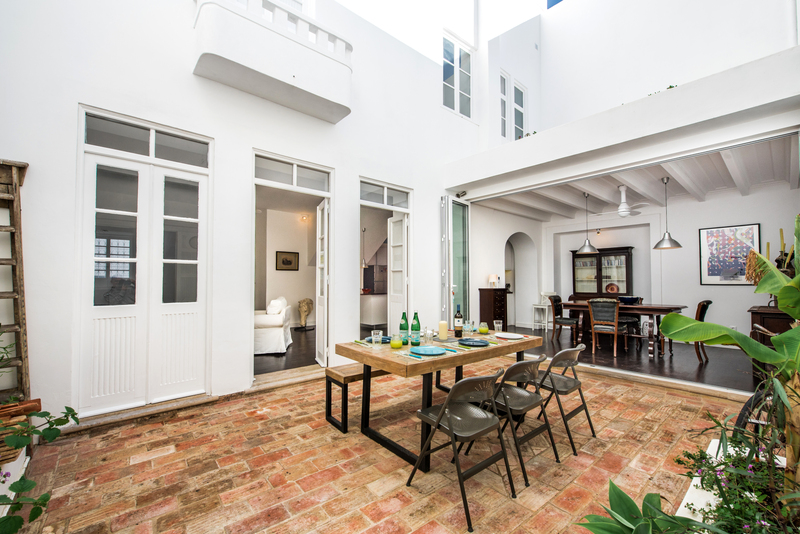 A stunning internal courtyard surrounded by the living room and ding area is located on the ground floor a selection of sliding doors and old style doors open in to the yard in turn making it feel all part of one room on the ground floor. Centrally located is a large outdoor wooden table with bench one side and three chairs the other. Specifically designed to take full advantage of some al fresco living. Raised flower beds surround two wall of the court yard and and planted with indigenous plants to include bouganviilia, banana and agaves. The floor is laid with Santa Catrina tiles very local to the Algarve and created in local factories by an age old method. 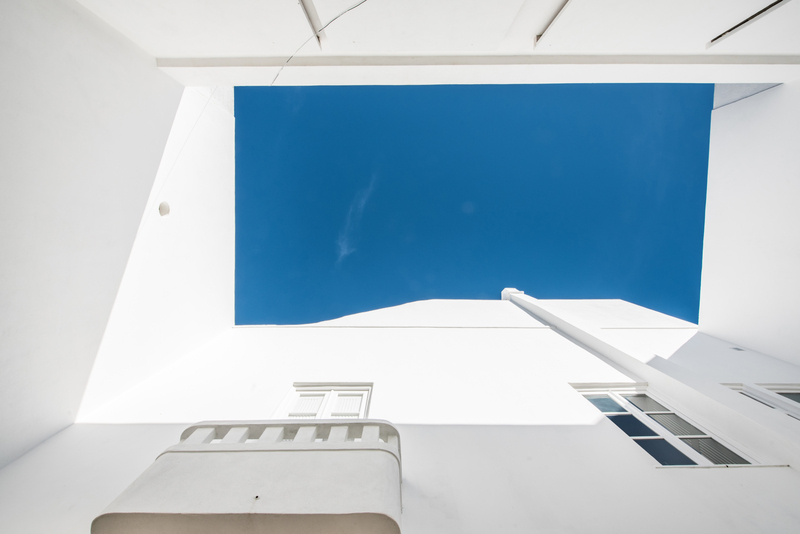 Look up and see the lovely old walls and balconies of the house thats add texture and feel to the courtyard and checkout the stunning blue skies and what a wonderful picture it makes. 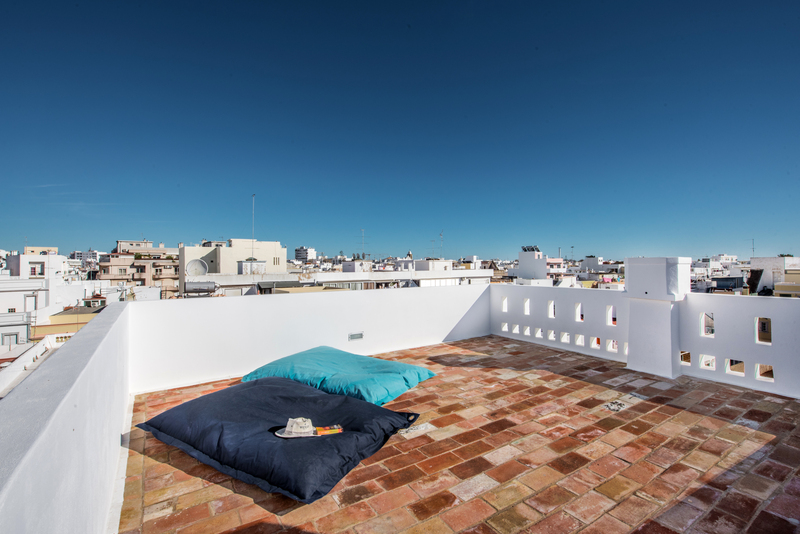 Lets head to the top of Casa dos Amigos and enjoy the roof terraces. From the top floor living space huge sliding double glazed French windows cab be opened on to an amazing roof terrace in and "L" shape complete with a super plunge pool. 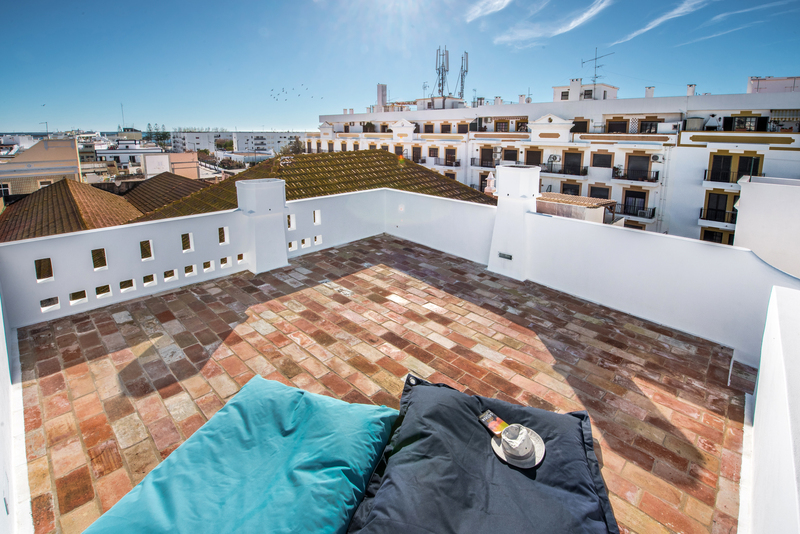 Enclosed by a wall that is quite low this spot is simply a relaxing haven to enjoy the gorgeous Algarve weather, sunbathe, maybe listen to music read and chill. A small table and chairs along with sun loungers and bean bags can be found and make for great places to sit and enjoy this wonderful space. 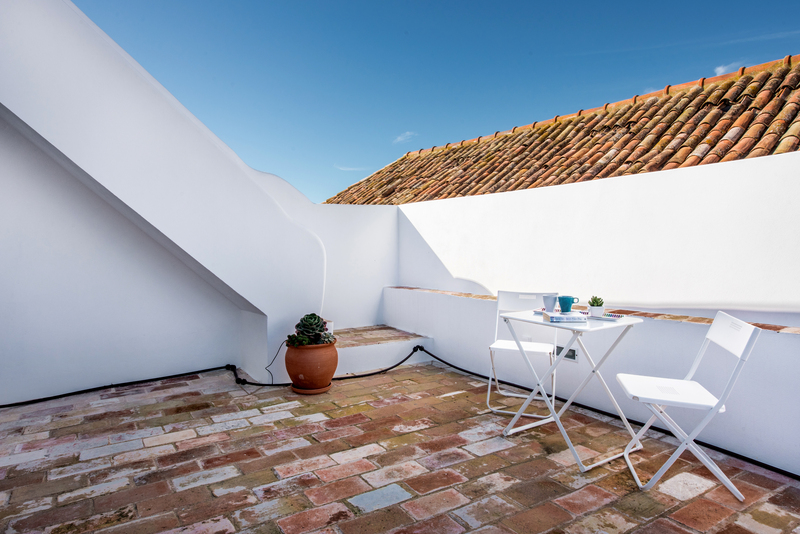 Tiled with Santa Catarina tiles and white washed walls this terrace is totally in keeping with the style of Olhao. 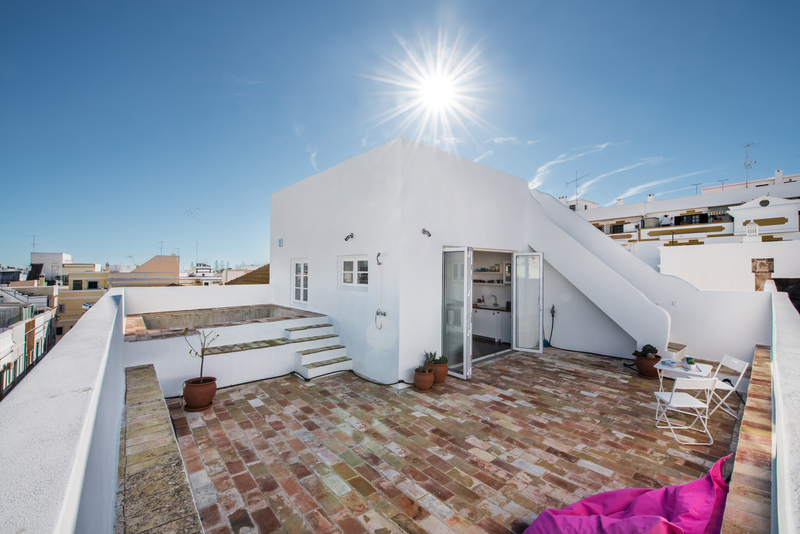 In one corner of the terrace steps lead up and into a square built in plunge pool for you to enjoy a refreshing dip after a hard day sight seeing or maybe enjoying the island beaches of Olhao. The plunge pool is totally stone built with Santa Catarina tiles along the edge and blue mosaic tiling inside giving a lovely blue glow to the cool refreshing waters. A set of steps at the edge of the first terrace lead up to another terrace once used as a look out for the fishing boats coming home from sea. 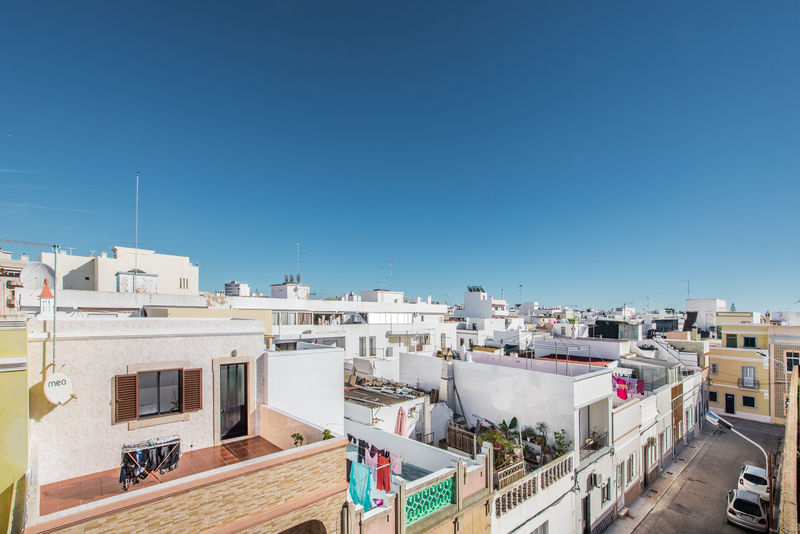 This means you have the most stunning views over the old fishing Town of Olhao and beyond. This spot again is a great place to relax on the bean bags and just enjoy your well chosen holiday home. The house was built by a wealthy family who manufactured furniture in the 1940's and next door the old factory is still standing....just! 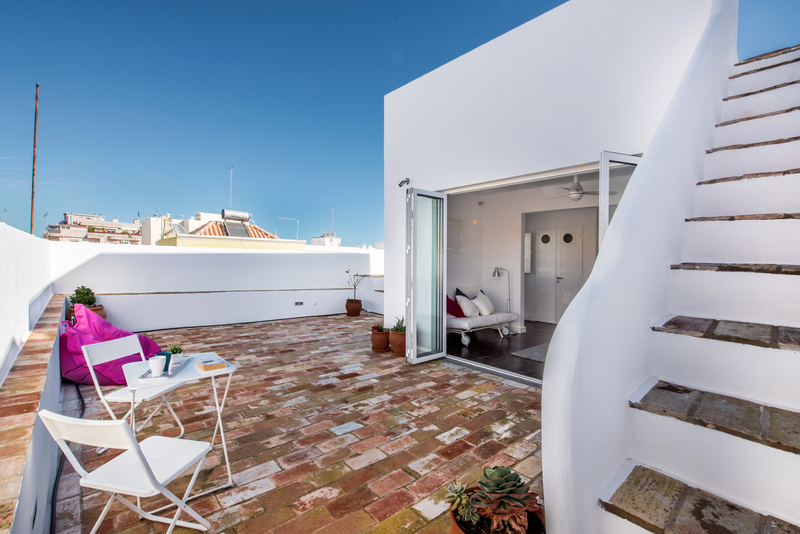 Casa do Amigos boasts superb architecture and some amazing features, it holds its charm having been very sympathetically renovated but it still makes a comfortable place to live and enjoy holidays. The owner loves to collect unusual objects and the house has been blessed with many of her interesting finds and adds to the ambience and character of the place. 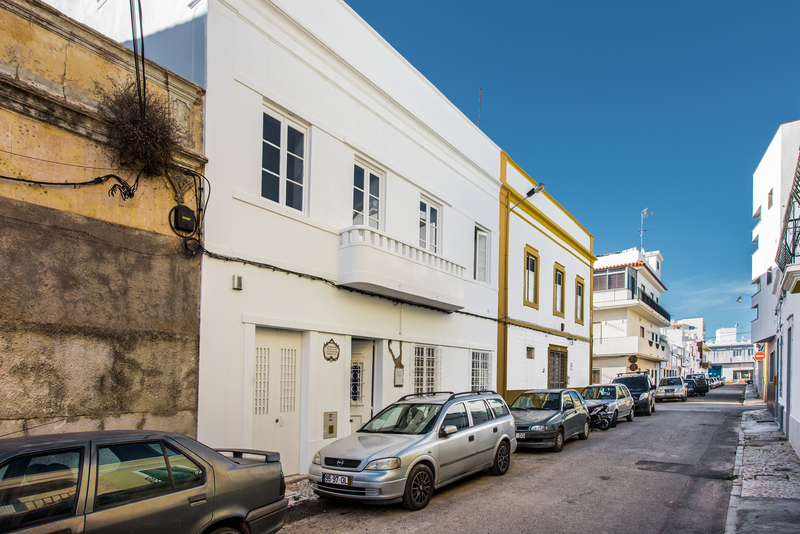 Located right in the heart of Olhao down a charming small side street our 3 bedroom townhouse offers a great location to take a holiday. There is no need to hire a car as both the train and v+bus station are nearby. You will find plenty of shops, restaurants and cafes within very easy walking distance. The beaches of Olhao are accessed by a ferry or flotilla of taxi boats. The mooring for the boats are close by along the marina and sea front of Olhao. Our lovely 3 bedroom Townhouse comes with its own manual that you can download to your tablet or smart phone. Packed full of information to make the best of your holiday starting from the moment you arrive. It tells you how to collect the keys, who will look after you during your stay and clear concise directions to Casa dos Amigos. Then it is packed full with details of the best restaurants, taxis and local amenities and activities. I challenge you not to just fall in love with Casa do Amigos!